After you’ve migrated your Jira Server instance to your Jira Cloud site, and you’re ready to migrate to a new Confluence Cloud site. Migrating Jira after Confluence may overwrite some of the migrated data. You’ll need a Confluence Cloud site set up before migrating. If you haven’t already set one up, start a free 7-day trial. Your Confluence Server site will need to be version 5.10 or later to migrate to cloud. If you’re running an earlier version, you’ll need to upgrade it first. This tool does not migrate any app data. You’ll need to check with the app developers to confirm whether you are able to move app data across. You can check what apps you’re using at my.atlassian.com. If you use a third-party user management system, you’ll need to check that it is compatible with Atlassian Access. The following generic groups are blacklisted and will not be migrated at all: “site-admins”, “system-administrators”, “atlassian-addons”, “atlassian-addons-admin”. Users from within these groups will be migrated, you will then need to manually add them to these groups after migration. Set up your Confluence Cloud site. If you don’t already have one, start a free 7-day trial. Back up your current Confluence Serverinstance. If your destination Cloud site has existing data, back up your Confluence Cloud site as well. Check your firewall. If your Confluence Server site is behind a firewall, you’ll need to allow access to *.atlassian.com. Once all of the prerequisites are complete, you can begin using the app. If your Confluence Server instance is version 6.13 or above you won’t need to install anything because it comes pre-installed, although you may be asked to update the app. See step 3 to locate the migration assistant within your server instance. Choose Install and you’re all set. It will also check for any user account errors, such as invalid or duplicate email addresses. You’ll need to resolve these errors before you can migrate. When you’re ready to add spaces to your plan, select Continue. 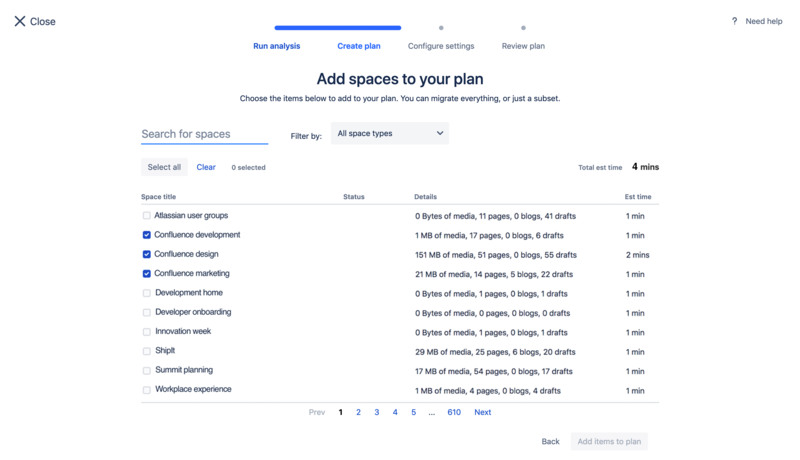 When you’ve chosen all your spaces, select Add items to plan. 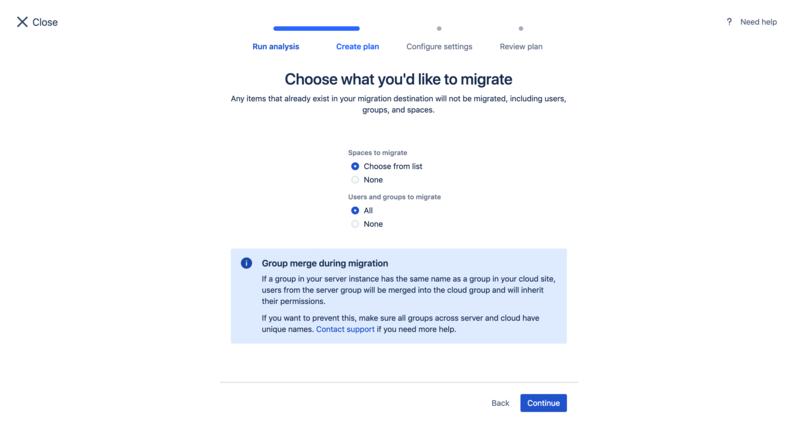 Select Choose cloud site and follow the prompts to log in to your Atlassian Cloud account as a Site Admin (if you’re not already logged in). When you’re ready, select Review plan. You won’t be able to run your migration until all user email errors are resolved. This is because these errors will cause the migration to fail. Your saved migration plan will be listed on the migration dashboard, where you can view its details or run it. You can also check the status of a plan, monitor the progress of a migration plan that is currently running, stop a plan that’s currently running, or create a new plan. You can create as many plans as you need. 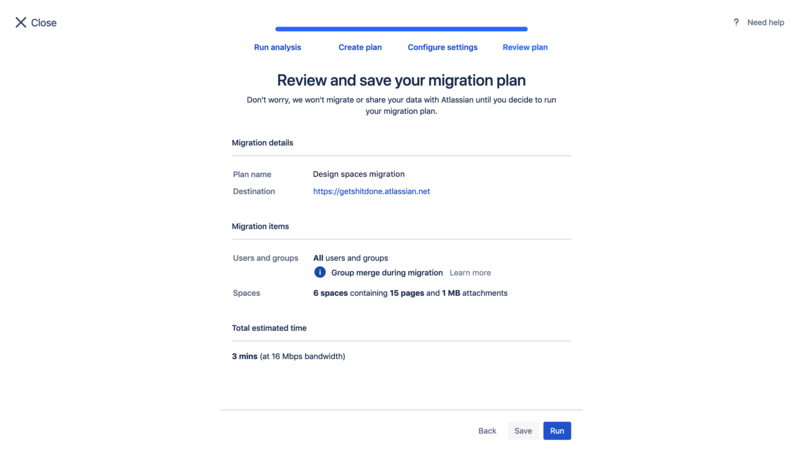 At this time, migration plans can’t be edited or deleted, so if you create a plan that can’t be used, just create a new plan to continue your migration to the Cloud. STOPPED Your migration plan has been stopped. Once stopped, it can’t be resumed. Any step already in progress will first need to finish before the plan is shown as fully stopped. 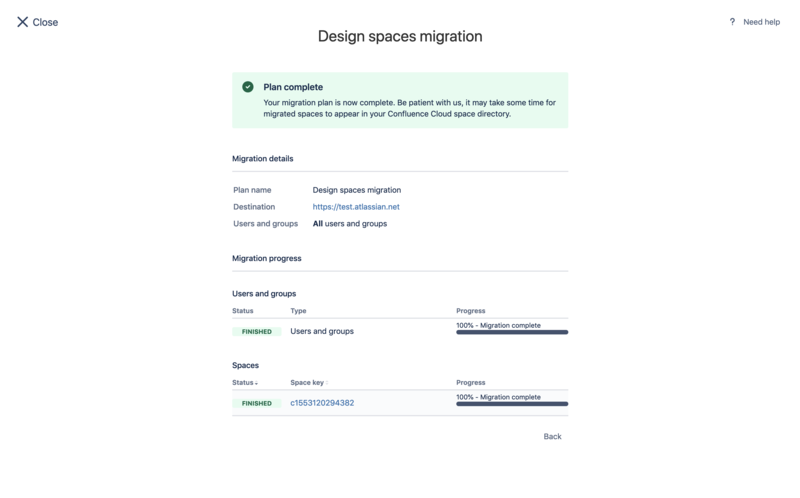 Some users, groups and spaces may already have been migrated to your Confluence Cloud site.